Now here's the kind of daffy I like! The daffodils are in full bloom around our house. They peep out of the ground even when the leaves on the trees have not made their appearance. Signs of spring, cheerful hello's from the ground. That is a sure sign spring has arrived. 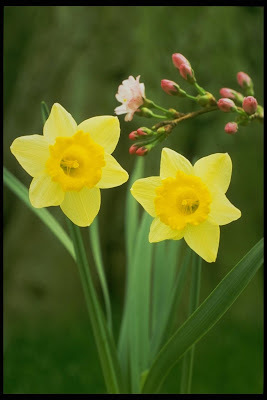 I love the daffodils. Yellow is my favorite color, so happy and cheerful. Our daffodils and hyacinths are in bloom right now. Still waiting on the tulips. Yard Sales: What's Your Philosophy?